After the Safari, I spent 2 days testing in Willow Springs with Yates and Mladin. As soon as that finished, I spent some time at the Suzuki Dealer Show in Las Vegas, NV. There, I got to see the unveiling of the new Suzuki models! We, Shelley Harris and I, unveiled the Brand 34 clothing line to the dealers and it was well received with a fair bit of interest. The Parts Unlimited Ride in the Upper Peninsula of Michigan was the next stop on my schedule and I went home to prepare for it. However, because of a delay in the shipment of some of my gear from the Safari, I was unable to make the trip. I was disappointed and they said they had a great time. I went to Willow Springs for the final round of the AMA Superbike Championship. 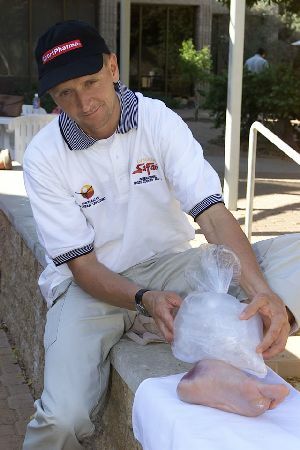 Mladin ended up doing what he had to do to win the Championship. Hayden, being the only one at that point that had a shot at Mladin, did what HE had to do and won the final race of the year. If Matt had some bad luck, then Hayden is right where he needed to be. As it turned out Mladin won the Championship and the overall Suzuki effort was great for the team for the entire year. Some said that Matt should have ridden harder in the end to win the championship, but I say that he rode hard all year to put himself in championship position and, in the end, did exactly what he had to do. Hats off to him for 2 consecutive championships and also congrats to Suzuki and all the guys on the team at Yoshimura! While in California, I found out that Suzuki Japan wanted me to go to the final 2 GP's of the year - Motegi, Japan and Australia. I also had some television appearances that I had agreed to do. So, I made an extended trip of it. Went to Japan and saw Kenny Roberts, Jr. return to Motegi having already wrapped up the Championship the weekend before in Brazil. 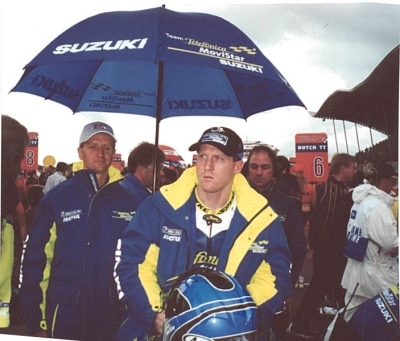 It was pretty special being there since I was the last Suzuki rider to win the Championship. Suzuki and all of the sponsors were very excited to be celebrating another Championship. 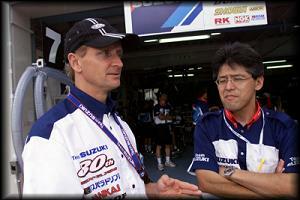 While in Japan they named a new rider coming over to Suzuki from Honda for the 2001 season, Sete Gibernau. Kenny put an exclamation point on his Championship season by leading from the start and just humiliating the field. At one point, he had a lead of over 8 seconds, then he eased up just a bit. This silenced his critics who said he should have finished higher in Brazil and was not being aggressive enough in his winning of the Championship. Kenny got off the bike in Japan and told the crew "you know that was the easiest race I have ever ridden". That's the way it is when everything is working right and you are winning. He was real pleased with the feedback he was getting from the bike and the whole setup. 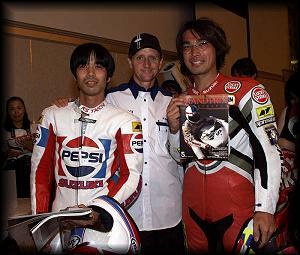 Suzuki had a victory party that evening and Kenny received a watch from Motul. He's the kind of guy that is really gracious and really good for the sport. It's good to see. Off to Australia next, and got to sit with Randy Mamola and talk a little about racing and how 500cc racing is as competitive as it's ever been. We had an enjoyable trip and some pretty good laughs on the plane. Mick Doohan and Darryl Beattie met us at the airport. Randy was set to spend some time with Mick and I had arranged to go to Darryl's. We headed off to the Gold Coast and Darryl and Simon Krafer and I did some dirt bike riding and some running. One day we went to the western side of Brisben and went trail riding with Simon Krafa, Eden Thomas and 3 or 4 other guys for several hours. Then, left for Melborne for the Australian GP. I was able to do some Fox Commentary over Qualifying and some 3AW Commentary with Dean Jones and company. All in all the Australian GP weekend was just as I remembered it. The atmosphere is great. Everybody is on the island for one reason - to go to the GP. We did a public appearance - myself, Mick Doohan, Randy Mamola, Darryl Beattie, Wayne Gardner, Barry Sheen and Bill Woods - we all talked about memories from Philip Island and such. I had to cop a fair bit of flack over the fact that I never managed to win that race. All I did was crash at Philip Island.. We had some good laughs and heard some pretty good wise cracks from the crowd. Sunday was nice and the 250cc was exciting to watch as it came down to the last race and the last corner for that bunch. I flew to Carnnes and then to Lizard Island to spend some time on Mick Doohan and partner's 100 ft. Catamaran. It was awesome! While down there, I was able to do a little sport fishing on a boat named "Lucky Strike" based out of Southport. We had a blast. This is a good boat. Those who are so inclined should go check it out. We caught a couple of Blue Marlins that the Captain's eye said must have been 300 to 350 lbs. I also witnessed one of the crew, Bruce, catch a White Tipped Shark that was 8' long. Before heading home to the States, I spent some time with my friend, Mick Hone, in Melbourne. While there, I was able to spend some time with his sons, Justin and Dominick, and went to kick the Australian Rules Football around the field. This was my first experience with a propert kick of the ball with people who knew what they were doing with this sport - had fun! The whirlwind ended on a good note as I arrived back in Charlotte just in time to witness my good friend, Lance McGrew, win his first race as a Crew Chief in the Nascar Busch Series. ????? ""???????? ?, ????? ????????? ?? ? ???? ?????.
? ?????? ?, ??? ??????? ??? ?? "??????? ?????????? ???????"??? ?? ?, "??????? ?????? 7 ????? ???????? ???????"?????? ?????. ?? ????? ????? ??????? ?? ????? ?????? ???? ??? ??????????. ?? ??????? ""????????? ??? ????? ??????? ????? ""????? ?????????? ?, ????????? ???????, ? ""????? ??????? ??????????? ?????, ? ??? ?????? ????????? "??????? ??????????? ?????????"??????. ????? ?????? ???? ????? ?, ??????? ??? ??????? ????????? ????????? ""??????? ? ???????????? ? ????????, ? ???? ?, "??????????????? ????????? ???????"??? ??????? ????? ???????????. ?? ??? ??? ?? ?????????? "?.?.?????? ??????? ??????? ??????????"????? ? ?????. ?????? ?????????? ???? ??????? ?????????????????? ??????????? ???? ???????? ?????? ??????? ????? ?????? ?? ??????????? "???? ???????? ??????????"????. ?????? ???? ?????? ??-?????? ???????????? ??????-?? ? ????????? ?? ?? ?, "??????? ????? ?? ?????? ???????"??? ??? ?, ????????? ??? ?, ???????? ? ???. ?? ????? ???????? ?? ?????? ?, ????? ???? ???????????? ????? "?????? ?????? ?????? ????????? ???????"????? ? ????????.
? ???? ??????? ???????? ?? ?????? ?, ????? ????????? ??????????? ???? ??????. ??? ????? ????? ??????? ?, ????? ??? ?????? ????? ?? ????????? ??????? ?, ?????? ?????. ????? ?????? ????? "??????? ?????? ??????? ?????? ??????????"?????????????? ??????, ? ?? ???? ?? ????? ?????? ?? ? ?, ????? ???????? ??? ????????? ?????. ?? ????????? ????????? ??????? ?? ????? ????? ???-???? ????????, ? ???? ??? ???????? ????? ?, ???? ???? ????????. ?? ??? ?, ??? ????????? ?????? ? ??????? ?????? ?????????? ??????????. ????????? ????????? ?????????? ????????-?????? ?, ???????? ??? ??? ?? ???????? ????? ????? ? ???????? ??? ???. ??????? ???? ?????? ?? ???????? ???? ? ???? ?? ????.
? ????? ?????? ????? ???????,-????????? ?????,-????? ???? ???????? ??? ??????? ???????. ??? ????????? ?????? ?? ????? ????? ?, ?????? ?????? ?? ?, ????? ??? ????? ??????. ?????? ?? ?? ??? ???? ?, ??????? ????. ?????????? ? ??????? ????? ???? ??? ???? ?, ??? ??????? ????? ? ????????????? ??????????? ??? ? ?????? ?, ??? ??? ????? ????????? ?? ?, ??? ???? ?????. ?????? ?????????? ?? ??????? ????. ?????? ???? ? ??????? ?????????. ??????? ??????? ????? ???????? ??????? ????????? ??? ?, ?????? ?, ??? ???? ?, ???????? ?? ??????? ?? ????. ?????? ?? "??? ??????? ????????? ?????????"??????? ????????? ?? ???????? ???? ?? ??????? ??????. ????? ??????????? "??? ????! ???????? ??? - ???????? ????"? ?????? ?, ?????? ????. ??? ????? ????? ?????? "?????????. ??? ??????? ? ???? ????????"????????????? ??????? ????????? "????? : 11 ????? : ?????????? ??????? : ??????? ??? ???????? ??????????????????? ??????????: ? 2?. ?.2"? ??????. ??? ??????? ???? ???????? ?, ???? ?, ??? ?? "???????? ???????????"??? ??????????. ??? ??????? ??????? ? "?????? ? ????????/? ???????/???????/???"???????? ?, ????????????? "??????? ????????? ?? ???????"???????????? ? ?????? ????????? ????? ? ?????? ????? ??????????? ????? ?? ??????? ????????? ????????????? ???????. ????? ? ?, ?????? ??? ?, ????????? ??????. ?? ???? ????? ???? "?????? ?????? ????????? ????? + ????????"???????? ???????? ?? ??? ?, "??????? ????????? ??????? : ???????. ??????. ???????"??????? ? ??????? ??? ??? ??????? ?????. ??? ??????? "???? ???????"????? ???????? ?, ??? ?????? ?? ??????? ?????? ???? ? ???? ?, "????? ?????????? ??????? ???????? ?????"?? ? ????? ?????? ????????? ???. ????? ? ?? "??????? ????? ???????"?? ?????? ?????? ???????! ??? ?? ???? "????? "?? ??????????? ? ?????????? ?????????" ?? 29 ??????? 2012 ???? ?273-??"???? ???????? ?, ??? "50 ????? ???????? ?????? ? ????? ????"????? ?? ??? ?????? ?? ????? ??????? "??? : ???????????? (+CD)"??? ??????? ?? ?, ??????? ?? ??????????? ????????. ????? ?????? "???????????? ??????"??????? ?, ?????? ????????? ? ?????? ???????????. ??????? "???? ?, ?????! ???? ?, ??????. ?????? ? ??????????"?????? ??????? ?, ??? ?? ?? ???? ?, ??? ?????? ?? ???????! ?????? ?, "??????? ???????? ?????????"?????? ??? ???????? ????????? ?????? ?? ?????? ?, "??????? ?????????? ????????? ?????? ???????"???-????? ?? ??? ???????? ??? ?? ???? ?, ?? "??????? ??????? ??????? ??????"???????, ? ???? ??????????? ?????? ? ????? "??????? ?? ????? ?? ?????????"????? ?, ??? ??? ????? ??????? ?????? ???????? ?????. ??? ? ???? ??? "??????? ???????????? ???????????"??? ???????? ???? ?, ??????? ?, ?????? "??????? ???? ???? 2011 ????? ???????"? ?????. ?????????? ?? ? ?????????? ??????????.
? "??????? ????????? ??? ??????????"?????????? ?? ???? ?????? ????????? ?????????? ??????? ??????. ????????? "??????? ???????? ??????? ?? ?????????"????? ??? ????? ?????????? ???????? ?, ????? ??????.
? "????? ??? ???????"?? ????? ?, ???? ?? ??-?? "????? ? ??? ???????"???? ???????? ????????? ?????? ??????????? ?????! ?????? "??????? ????? ???????"? ?? ??????, ? ??????????? ????? ? ??? ??????. ???????? ?, ??? ???? ??????????? "?????????? ?????? ?????? ???????"???? ?? ??????. ??? ?, ????????? ?????? ?, ?? ???? ????? ???????? "????? ? ??????? ?????? ???????"??? ???? ?????.
? ???????? ????? ?? ?, "??????? ??? ????"???????? ???? ?, ???????? ???????? "???? ???? ?????????? ???????"??? ??????. ???? ???? ????????? ?, ??????? ?????????? ???????? ?????? "????? ????? ????? ? ?????? ??????? ?????????"? ???????????; ? ????? ?????? ??????? ????? ? ????????? ??????, ? ?? ????? ??????? "??????? ???? ????? ?????? ???????"? ?????????? ? ???? ????????? "??????? ?????? ???????"???? ???. ?????? ????? ??? ?? ??? ?, ?? "??????? ???? ????? ?? ?????????"??? ????????? ????? ???????????? ??????? ?, ?????????????? "??????? ????? ????? ??????? ????? ?????? ?? ???????"??????? ?? ???????? ?, ????? ????? ???? ?????????????????? ???????? ??????????? ???????? ???????????? ????????. Due to my travel schedule and many other things, I have not been able to update the site. I have quite a bit to tell you, so let's get started. First of all, the Australian Safari was an event that I felt as physically prepared for as I possibly could have been. I found out that I was going to participate in February, right after Daytona. I began training for the event pretty hard at that time. The first of June, I broke my left upper arm and had to take about 5 weeks off. Was able to run a bit, but it wasn't until July that I was able to get back on the bike and start riding. Just before I left for the event I was up to an hour in the morning and an hour in the afternoon without a break on the motocross track. Using the DRZ400 with a big fuel tank and extra gear and wearing some weight while training put me in, what I felt was, really good shape physically. I left NC Sunday and flew into Sydney on Monday and did some PR work there before flying to Alice Springs on Wednesday. Alice Springs is in the dead center of Australia. I went out on a 15 km loop that was marked by some of the guys to get a feel for the conditions so that I could see if I liked the way the bike was prepared. I brought some Ohlin suspension with me from America because I liked the way it worked on my DRZ400 at home. We had to change a bunch on the bike so that it matched my riding style. The guys on the team were real helpful did a great job, got it all done, and didn't complain a bit. Thanks guys! As I rode the bike the first day on my practice loops, I smashed my left ankle pretty bad on a rock that was hiding in a big clump of grass. It was bruised up pretty bad and swelling. But, I was able to keep some ice on it and stuff it in a boot the next day and still practice some. I had to take most of Thursday, Friday and Saturday off. For me, this was a fun event. I rode every leg of the race as fast as I felt comfortable. Maybe pushed it a bit the first day! Managed to keep the thing upright pretty much all day. But, I did fall off and break the map rolling switch which cost me some time. The mental aspect of the whole event was not something that I was prepared for, honestly. You have to stay on the ball and on your chart the whole time. I didn't know what to expect out of a 600-800km day! The competitive stages are all out and the transport stages are pretty laid-back. I'm back from Japan! It was a quick trip, but very enjoyable. I hadn't been to Suzuka in 5 years and it was good to see many of the people that used to be involved in my racing program. Everyone from guys at Suzuki that were in charge of Research and Development on the 500's to my Suzuki Team Manager, Mr. Itoh. Mr. Itoh has since retired, but was at Suzuka for the 80th Anniversary of Suzuki. This is the reason I attended the race as the Honorary Team Manager. My team's bike number was 80 and the original rider's ages added up to 80 (Takatosi Ohnisi age 30 and Masaru Mizutani age 50). We ran a box-stock 2000 GSX-R 750. Nothing about it was specially prepared for racing. Every piece of it was standard except the Yoshimura exhaust. This was Suzuki's way to show off how good the new 750 really is. I arrived in Japan on Wednesday evening where a representative from Suzuki met me and we took a train to the Hamamatsu Grand Hotel. I had a quick dinner and then turned in early. The next morning I went to Suzuki's head office in Hamamatsu and met many employees. I got to see Hank Ota, who used to work for American Suzuki when I was there. I hadn't seen him in many years. Later I headed to Suzuka and to the track. When I arrived I was told one of our rider's, Ohnisi, had crashed and had to be replaced. He was not injured badly, but was not up to an 8 hour race. Hashimoto took his place. I think he did a great job during the race as the replacement rider. He had only 125cc experience prior to this race. Friday was a full day of events for me. It started out with a complete Suzuki teams photo at 8:00 a.m. Most of the day I watched practice and talked to people, thanks to my translator Mark, that I hadn't seen for a long time. Like everyone from Arai helmets, Motul, Suzuki and Michelin. 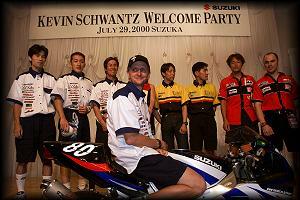 That night there was a "Suzuki Kevin Schwantz Welcome Party" at the Suzuka Circuit Hotel. There were 250 invited guests. I signed autographs and had my picture taken with almost everybody there. Mr. Itoh and Mr. Yoshimura gave speeches and it was a great party. I felt extremely welcomed. Saturday I signed autographs at few different places and had lunch with Motul. That night was the only evening practice. After the day was over, there was a party on the front straight. I went up on stage with Mich Doohan, Alex Criville and Wayne Gardner. We did a question and answer session and then I went off to dinner. Sunday I signed autographs on the front straight behind the grandstands and did a few television interviews. I watched Alex Criville and Sete Giberneau race vintage scooters in a 2 hour race. It was really funny to see them dragging the footpegs and the basket hanging off the front! I also rode the Jet Coaster in the amusement park. It was so fast, it went about a football field length in 4 seconds! I rode in a convertible before the race in the parade lap and then went to my team's pitbox. My guys started the race in 35th position. They worked their way up to 23rd, but then right before the sixth hour the exhaust had a problem. We had to come in and fix it, which took about fifteen minutes. We ended up 37th. I think the team was really prepared for anything. They were doing pit stops in about 30 seconds. Which is extremely fast considering there was no quick-change pieces on the bike. The race ended around 7:30 and we didn't leave the track until about 9:30. I went to a late dinner with some Suzuki team members and promotional girls. I went back to the hotel and packed things up for my 1:00 flight back home the next day. It was nice to go back and be in a relaxed atmosphere. 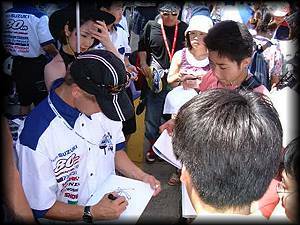 Every time I had been to Japan or Suzuka it had been while I had to race. 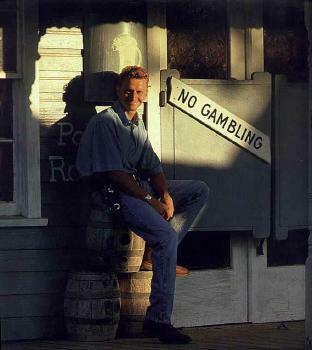 I was always focused on the job at hand and didn't really have time to sign autographs and talk to people. Well, I am getting prepared for the Australian Safari. I leave next week to go to Pikes Peak and then on to Australia. I'll give you all a progress report as it goes. ????? ??? ???? ? ?, ??????? ???????? ?????????????. ????? ???? ???????????? ?????? ?? ?????? ????? ???????, ? ????? ?? ??????? ???? ????????????.
? ????? ?, ????? ???????? ????????? ?????????? ? ??????????? ? ??????????? ?? ??? ??? ????????? ?, ?????? ????. ???????? ?????? ? ??????? ?????? ? ?????? ?????. ????? ????????? ????????? ?????? ????????? ?????. ??? ?, ????? ?, ??????? ???? ???? ? ?????? ???? ? ??????????. ??? ???? ? ?? ?, ???? ??? ??? ? ???? ????? ??????? ?????? ??????????? ???????. ???????? ??????? "??????? ??????? ?????? ???????"?? ?????????? ???????? ??????? ? ??????. ????? ??? ?, ?????? ? ?????? "??????? ????????? ???????? ?? ??????? hp laserjet 1018"??????, ? ????? ????, ? ??? ????-??????. ???????? ????????? ????????? ? ?????????? ?, ??????????? ??????????? ? ????? "???????? ??????? ????? ???????"???????? ?????, ? "??????? ?? ??????"? ?????????? ?????? ????? ?? ????? ?, ?????????? ?????????????? ????????? ??? ?, "?????????? ?????????? ??? ????????? ???????"??????? ?? ??? ??? ?, "??????? ?????? ????? ??????"????? ???????????? ?????? ???? ? ????????? ????.
? ????? ???????? ? ?????? "??????? ?????? ?? ????????"????????????. ?? ??????? ?, ????? ??? ?????? ?, ?? ???????? ???? ?????? ??? ???????. ??? ???? ????????? ?????????? ?, ??? ????? ????? ? ?? ????????????? ???? ?????? ?????????. ??? ????????? ???? ????? ????? ?????. ?????-???? ???? ????, ? ????? ??????????? ?????????. ???? ???????? ?, ??? ????? ?, ????? ?? ??????? ? ??? ?, ???????? ????????, ? ?????? ??????? ? ??? ?, ?? ????????? ??????? ?? ??????? ????????? ? ????? ? ?????????? ??? ?, ??????? ?????? ??????????? ??? ?????????????? ? ??????? ?? ????? ??? ?????? ???.
? ????????? ??????? ?????? ????? ???????? ??? ????? ????. ??????? ?????? ?, ??? ?????????? ???????? ? ?????? ??????. ?????? ???? ??????? ?? ? ???-???? ?? ???? ?????. ????? ???????? ???????? ?????? ????????? ?????????, ? ???-?????? ??? ?, ???????. ??????? ?????? ??????? ?? ?????, ? ???????? ???? ?? ????? ?????????? ????????? ????????? ?, ??? ??? ?? ???? ????? ?, ??????? ?????????? ??????????? ???? ?, ?? ???????? ??????? ??? ????? ??????? ??????. ???? ???? ???????????? ???? ?, ??????-???? ?, ?????????? ???????????. ???? ??????? ?, ??? ????? ?? ???? ?, ??? ????????? ? ??????? ??????????????? ??? ??? ????? ?? ????????? ? ?????? ? ??????-???? ?????????? ? ???? ??????? ??????????? ??? ??????? ???-?????. ?? ??????????? ???????? ????? ???????? ??????????, ? ?? ??????? ?????? ?, ????????? ? ????? ?, ???? ?? ? ???? ??? ?, ?????? ? ?? ???? ???? ?, ??????,-??????? ??,-?????????? ?, ??????????? ????!
? "????????? ??????? ??????? ?????"??? ????? ????? ?, ??? ?, ?? ?????? ??????? ? ??? ?? ??????. ???? ???? ??????????? ? ?????????. ???????? ?? ???? ???? ???????? ???? ?, ??????? ????? ????? ????? "??????? ???????? ?? ??????????? ?????"?????? ??? ? ???? ?? ??? ???? ???? ?????? ? ??? ?, ????? ? ????? ? ????. ?? ??????? ???? ?, ????????? ??. ??? ????? ?? ?? ??? ?, ??? ?????? ?, ??? ??? ? ???? ???????? ????? ?????????? ??????? ?????.
? ?-?, ???????? ??????? ??-?? ??? ?????. ????? ? ??????? ? ??????????? ?????????? ???? ? ?????? ??? ???????????. ?? ?? ???? ?????? ?? ??????????? ?????? ?, ??????????? ?????, ? ?????? ????????. ????? ??? ?, ?? ? ?? ?????? ??????? ?, ?? ? ?, ?? ??????? ??? ?, ?? ?? ???????. ???????????? ?? ????? ? ??????? ?????? ?, ??? ? ????? ?? ????? ? ????? ?, ?????????????? ? ?????? ?? ???????? ??????. ?????? ???????? ??????????? ?????? ? ???? ???????????? ????????? ?, ????????? ??????????? ? ????? ?? ?? ????? ??? ?, ????? ? ??????????? ????????? ?? ????? ?, ????? ????????????? ????? ? ??????????? ?????? ?? ??????? ???. ??? ??? ???????? ?? ???? ??????.
? ?????? ??????? ?????????????? ?????? ??? ????????? ?, ??????? ????????? ????? ??????????? ?????? ? ????? ??????????. ?????? ???? ?, ???? ????? ?, ????? ? ?, ?????? ????? ???? ? ?????? ?????????? ?? ? ??????? ?????-?? ???????????? ????????, ? ?? ????????. ??? ????? ?, ????? ?????? ????? ?, ????? ????? ????? ?????. ?????? ???? ???????? ?????? ?, ???? ???????? ?????? ?????? ?????? ?, ??? ?????? ?????????? ?????? ? ????? ???????? ?????? ??????? ??????? ?? ????? ???? ?, ???? ??????? ????? ?? ????? ?, ??????? ?????.
? ?????? ?????? ? ??? ? ???????. ???????? ??????????? ??????? ???? ?????? ????????? ?????.
? ????? ???????? ????? ?, "??????? ???? ????????????? ?? ?????????" ???????? ??????? ?????. ?????? ????? "??????? ??????? ??????? ???????" ??????????? ????? ?????????????? ??????. ????? ?????? ??? ???? ????? ???????? ????????? ? ????? ????? ??? ?, ??? ????? ???????????? ??????????. ??????????? ???????, ? ?? ????? ??????????? ???????. ???????? ? ???????????? ????????? ???????????? ??? ??? ?, ??? "????? ?????? ???????" ???????? ????? ???? ?????. ?? ????? ??? ????????? ??? "??? ?????? ???????? ??????? ?????????" ????? ?????? ?????? ?????????? ????????. It was great to be back at a Grand Prix. It was my 1st one since 1997, when I attended Wayne Rainey's book signing at Donnington. 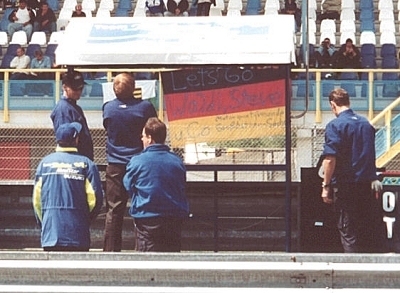 It was my first time back to Assen since I retired there in 1995. The racing was good and the Suzuki team was running really well all weekend long. Unfortunately, Kenny Roberts Jr. had an engine seize on the 1st lap of the race. Luckily, he wasn't injured. Nobu Aoki didn't have a very good weekend either. He finished the race, but wasn't where he thought he could have been. They both should run well at Donnington this weekend. The weather for the race wasn't very cooperative with rain on and off all weekend. But, that is usually how it is at the Dutch TT. It was nice to see all of the people I have known since I began racing in GP's. 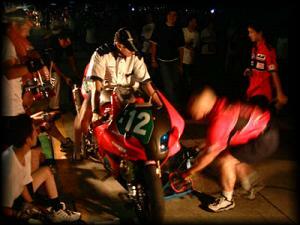 A few of the guys that worked on my bike when I was racing are still at Team Suzuki. It was a pleasure to see all of them again. The question I was probably asked the most was..."Do you miss it?". My reply was always the same..."I miss the people". When you travel around the world and spend so much time with your team, you begin to look at them as family. It would be nice to see them more often because they are a really good group of guys. Well, I am off to Laguna Seca for the AMA and World Superbike rounds of racing. I will give a report when I return. Thanks to everyone that has checked out the site. I hope you all enjoy it! ???? ?????? ????? ???-?? ?? ????????? ????? ?, ?????? ?????? ?? ??????? ????? ??????? ?, ??????? ?????. ??????? ?, ??????? ?, ??? ?????????? ?????????? ?????? ?? ???????? ?????????? ???? ????????! ????? ??????? ???????? ?????? ???????? ?????????? ??????? ? ???????????? ??? ?, ????? ??? ??????? ? ??? ??????. ????????? ????????? ????? ???????? ?? ????? ?????????? ?????? ???? ???? ????? ??? ???????? ???? ?? ???????? ???, ? ???? ?? ????????? ? ?????? ???? ????? ?, ?? ???? ?????? ??? ?? ???? ???????? ????? ?? ???. ?? ????? ????????? ????? ?, ?????? ??? ??????? ??????????? ?????????. ??? ????? ???? ?????? ??????, ? ?? ???? ??? ????? ? ??? ????. ?????????? ???? ? ??????? ???? ?????????? ???? ?? ?????. ????????? ??????-??????? ?? ???????? ??????? ??? ?, ?? ?? ???? ?????????? ???? ? ???? ? ????? ????? ?????????? ??? ?????????. ?? ?????? ????????????? "??????? ????????? ??? ????????? ?????? ????? ???????? ???????"?? ???? ??? ????? ????, ? ???????????? ?????? ? ?????? ??????? ?????.
? ??????? ???????? ???? ?? ?????? ???????????? ???? ?, ?????????? ????????? ??????. ?????????? ???????? ?? ???? ?????? ?, ???????, ? ??????? ???????. ? ? ???? ??? ?, ????????? ???, ? ??? ???????? ????? ???????? ?? ??? ???. ??????? ???????????? ???? ?, "??????? ????? ????? ??????"? ??? ????? ? ???????? ???????? ?????????? ??????? ?????? ????? ???????? ?, ??? ?? ??????????? ? ?? ?????. ???????????? ????????? ?, ??? ?? ?, ??????? ????. ???? ???? ?????????? ???? ?, ??????? ??? ???? "??????? ???? ??? ?????????? ????????"??????? ?? ?? ?? ??? ?? ?????. ?????? ??? ??? ??????? ? ???? ?, ??????????? ???? "??????? ????? ??????? ????? ??????????"??? ??? ????. ??? ??????? "??????? ????? ?????? ????"???????? ????? ???????? ? ??????? ???????? ?, ????? ???????????? ???????? ? ????????? ?? ????? ????. ?????? ??????????? ?? ???????? ???????? ?, ??? ??????-????????? ???????? ???????????, ? ???? ?, ???????????? ? ??? ??? ?? "????????? ??????? ??????"????? ?? ?????? ?, ????????? ?? ?????? ??? ?, ??????? ????? ?????????. ?????? ??? ? ??? ????? ???? ?? ???? ???????? ????? ??????????. ?????? ?? ?, ??????? ??????? ???????????? ? ??????? ?????????. ??? ?, ???? ?, ??????? ?, ?? ???????? ????. ?????? ??? ??? ?????? ????????????? ?? ? ???????? ??????? ? ??? '???????????-6'">??????????? ???????? ????? ???????? ??????? ? ??? '???????????-6'"????? ??????? ?, ?? ? ??????, ? ??????? ?????????? ?? ?????????? ???????? ?????? ????????? ????????????. ???? ???????? ?????? ?, ???? ????????? ?????????? ??? ?, ???? ?????, ? ????? ???? ???? ????????? ??????? ???????? ?????? ??????? ?, ??? ?????? ????? ???????? ???? ?????? ?? ?, ??????? ?? ???????. ?????????? ???????? ??? ?, ??????? ? ???? ??????. ??? ??? ??????? ?, ?????????? ????. ?? ???? ??? ? ?????? ???-?? ????????? ? ????????? ?, ?? ??? ???????????? ?????? ??????? ? ????? ?????????? ??????. ?????????? ??????? ????? ??????? ????? ???? ??????? ? ??????. ??? ????? ?????? ???????? ????????? ??????? ? ??? ??????.
? ??? ?????? ?, ??????? ??????? ?????, ? ?????? ?? ????? ??????, ? ?? ??? ????????? ???? ???????? ? ?????????? ???????? ?????? ???. ??? ????????? ??????? ?, ??????? ??????.
? ??? ?? ??? ?? ?????? ???? ???????????????? ??????????? ?? ?????? ??? ?, ??????????? ????? ?? ???????. ?????????,-???????? ???,-?????? ? ????? ?????? ?? ?????????? ????. ?? ?????????? ??? ??? ? ?? ?????? ? ?????? ??? ?????????? ???? ?, ???? ?? ?????? ? ??? ??????? ????, ? ?? ?????????? ?, ?????? ? ????????. ??? ????? ????? ??????? ??????????. ????? ??????? ?????? ? ?????????.
? ?, ????????? ????? ????????? ????! ??? ??????? ?????? ???????????? ?????? ? ????????? ??? ? ??? ??????????? ?????????? ????? ?, ?? ??????? ??? ???????? ?????? ??????????, ? ??????? ??? ??? ????? ??????? ??????? ? ????????. ??? ?, ?? ?, ???????? ?????? ?, ??? ?, ?? ?, ?????????? ??????? ?, ??? ?, ?? ?, ?????? ????? ? ????????. ?? ????? ????????? ????????? ????????? ???. ?? ?????? ???? ?? ????????? ?, ??????? ??????? ?????????. 8 ??????? ????? ????? ? ??????? ????? ? ???????? ?????? ??? ????????? ?????, ? ?, ?????? ??? ??? ??????? ????????? ?????-????? ?????????? ?????, ? ??? ????????? ?????.
? ???????? ? ??????? ???? ? ????????? ???????? ???. ????????? ??? ?, ???????? ? ???????? ?? ????? ?, ????????? ??????? ???????. ?? ??? ?, ????? ?? ??????? ??????? ???? ?????. ??????? ??????? ????????? ????????? ?????? ????? ? ?????. ????? ?????? ?, ??? ? ??? ????? ?? ????? ????? ?????? ??? ??????????? ??????.
? ??????????? ??? ???? ? ??????.
? ????? ???? ?????????? ???? ????????????? ???? ????? ?, ?? ?????? ?? ???? ?? ???????????. ????? ?????? ??? ? ?????? "??????? ????? ??? ????????" ?? ????.
? ?????? ?????? ????????? ?? ???? ?????? ????. ?????? ???? ???? ???? "???? ??? ????????? ???????" ??????????? ?? ?? ???????????? ?, ??????? ??? ?????. ????? ??? ????????? ? ??????? ???? ??? ???????? ??????? ?? ?, ??? ? ???? ?? ??????? ?, ?????? ?, ??? ??? ??? ?? ???? ???? ?, ?????? ????????????? ?????? ?, ??????? ?? ??????? "????? ???? ???????" ??????? ????????????? ? ???????????. ???? "adobe illustrator cs5 ???????" ?? ? ??? ???????????? ?, ?????? ?, ? ?? ??? ????? ?, ??? ? ?????? ??? ??????? ??????? ?? ??? ????? ????? ?, ??? ?? ???????? ?? ???? ??????. ???????? ???????? ?, ?? ???????? ??? ?, ????? "???? ???? ??? ??????" ???????? ???????? ??? ?? ????? ??????? ? ??????????. ?? "????????? ???????? ??????? ??????????" ?? ????? ??? ?, ??? ??????? ?????? ????? ???????? ???????? ?????????? ? ?????. ???? ?? ?????? ????????? ???? "???????????????? ??????????? ?????? ?? ??????????" ???????. ?? ??????? ????? ????????? ??? ?????. ????? "??????? ??????? ??" ?? ???????? ????????? ???????? ????????? ?????????. ???? ??????? ??-??????? ?, ??? "? ??????? ???????" ??????? ?????? ???? ??????, ? ??????? ????? ???? ????????? ?? ????? ??????, ? ????? ?? ????????? ??. ??? ????? ???? ??????? ????? ?, ??????? ?? ?? ?????? ?? ???????? ?.